The American DJ Mega Go is a series of wireless lithium ion battery powered LED fixtures and we had the pleasure of reviewing two of the lights from this series. Our first impression was how light these units are. Having a case made of a polymer composite and not steel removed about 50% of the weight normally associated with battery powered lighting. Both the Mega Go PAR 64 and the Mega Go Bar 50 weigh in at a mere 5 pounds. 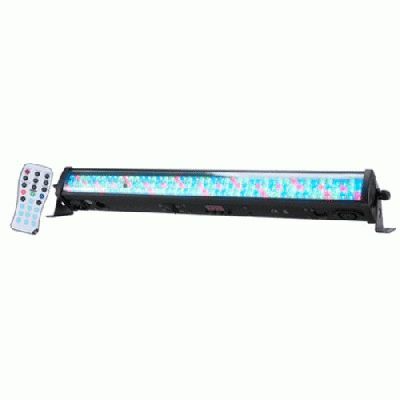 For those who want to get serious about doing uplighting, this will come in handy when you are carting about 20-40 of these units. The battery that these units are equipped with can power them for up to 8 hours on a single charge. On the bench, we discovered that unlike other battery powered LED fixtures, the battery is user replaceable. Coupled with the 50,000 hour LED life, this means you will have a fixture that will outlast lights at twice the price. This makes for a sound investment. As with all the lights from American DJ they did not skimp on features. The Mega Go units have built in DMX, no duty cycle and a wide array of features including built in program modes. With the Mega Go LED lights there is not question as to how much your battery is charged or how much life it has left in it. Using the handy battery life indicator built into the control panel you will know exactly where you stand. Another convenience we found was the infrared controller that is included. This made setup a breeze. As lightweight as these lights felt we did have some concerns as to their performance. We took two of the MEGA Go PAR 64 and two of the Mega Go Bar 50 fixtures out in the field for two live events to see exactly how they look. 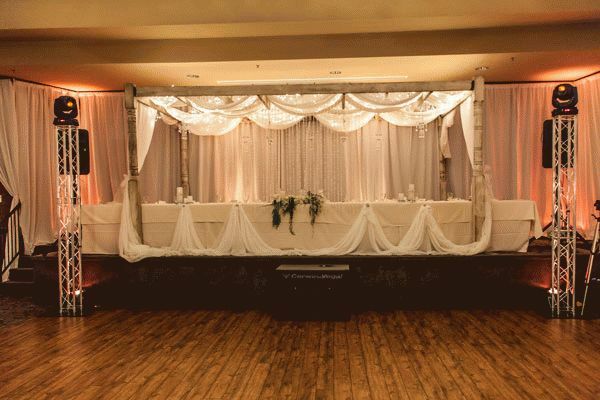 At our venue, we needed to light up a stage where the head table would be. 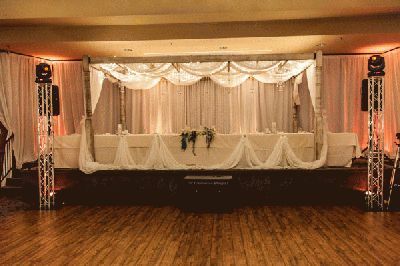 The stage was 40 feet wide and had a ceiling of 9 feet. We placed two Mega Go PAR 64 units in the corners and the two Mega Go Bar 50 units along the back wall. Somewhere around 3pm we set the lights using the internal RGB controls to get the right color on the walls. The bride wanted a very specific shade of amber and white. The controls on the Mega Go units allowed us to dial in the color she wanted. At 11pm when the event ended, the lights were still going strong. Check out the photos. 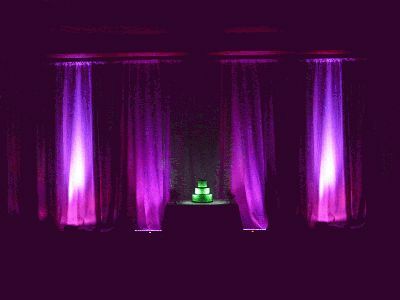 Our next task at a different event was to set up the wall where the cake table was. The lights were placed about 9 feet apart and the ceiling was 14 feet. We used the “set it and forget it” method. 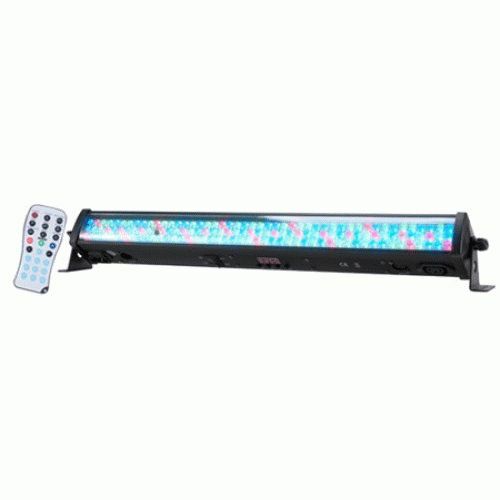 We placed the lights and then using the IR remote we set the color to one out of the 32 that are built in. See the photo. As you can see, the Mega Go lights came through for both events providing a nice uplight effect for well over 8 hours. The major difference between the Mega Go Par 64 and the Bar 50 is the Par 64 gives you a more pronounced light and the Bar 50 gives you more of a wash. 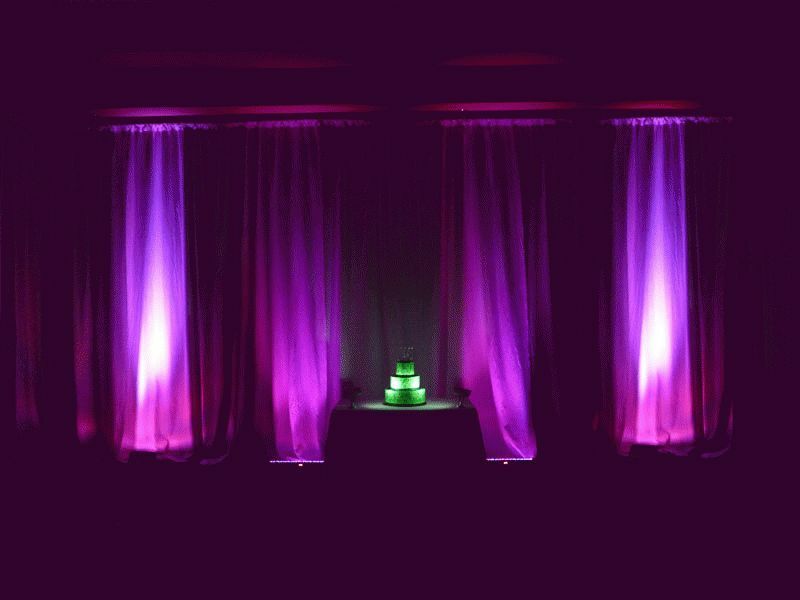 Since those two events, we have used them in all sorts of applications including lighting up signs, lounge furniture and even photobooths. 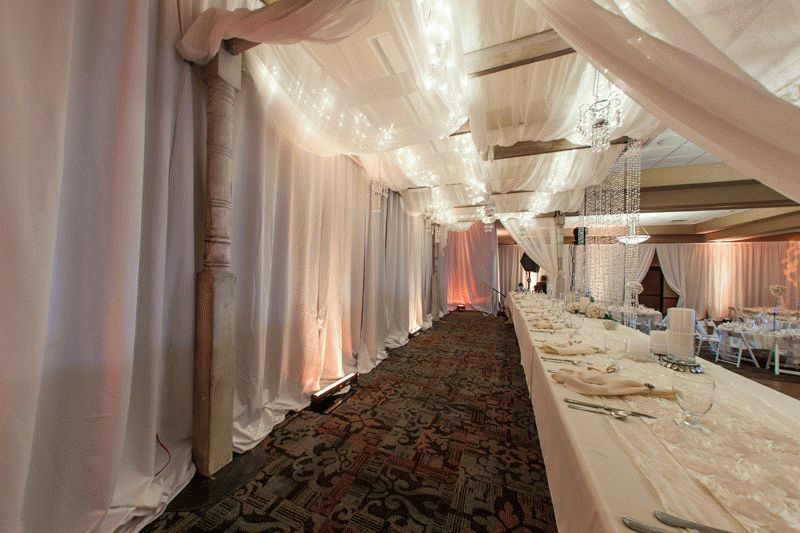 Just about anywhere we needed a light in any color, including white, we were able to use the Mega Gos. 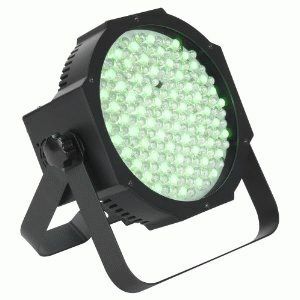 Twenty of the Mega Go LED lights weigh less than a powered speaker and cost about $3k or half of any comparable fixture on the market today. Even though it may appear to be quite an investment, the rich features and flexibility of these lights coupled with the right marketing and business sense should make for a huge return not only in your wallet, but the savings from not having to visit the chiropractor.